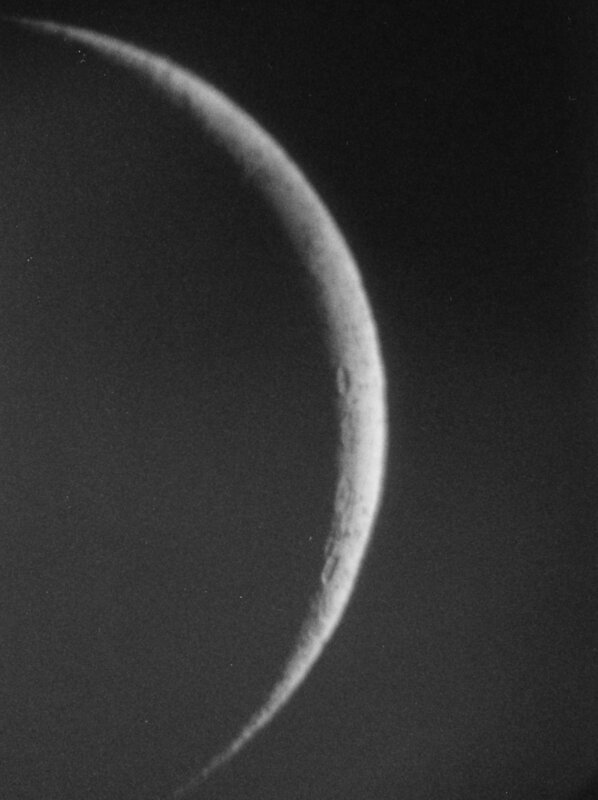 The Moon is in its thin waxing crescent phase two days past new. The terminator, the sunrise line, defines the left-hand edge. North is to the top. Four craters are readily visible at the terminator, starting with Langrenus just above center. Below it are, in descending order, Vendelinus, Petavius, and Furnerius. The extreme shadowy western edge of Mare Crisium lies about halfway from the center to the top. Langrenus is 132 kilometers (82 miles) in diameter, Petavius 177 km. Note the severe foreshortening of the nearly-circular craters, the result of lying at the edge of a sphere. By Jim Kaler. Return to MoonScapes, Skylights, or STARS.